Most people have a fairly clear vision of what a Viking ship looks like, but maritime scientists can almost get into a fight, when debating whether a newly built ship may be called a Viking ship or not. On the following pages, you will find descriptions of ships that meet the demands of most scientists. They are all clinker-built, and have pointed stem and stern. They are driven by a square sail, and have the rudder placed on the side, not astern. 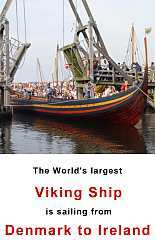 Furthermore, they all have a size and shape that makes most people define them as Viking ships. Some will claim that a Viking ship must be built with cloven planks. Others, on the other hand, will accept a wide range of vessels as Viking ships if they just have a Viking like look. 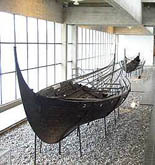 Many coastal boats are found at Viking Fairs, justifyably acting as Viking ships, although they have the rudder placed astern and represent a later Norwegian type of boats.